The Starry Starry Lights are made with a fine bendable copper wire that can conform to any shape to add a beautiful decorative accent. Flexible yet durable, the string lights are perfect for positioning lights to any decorative or holiday project. Warm white LED's are individually mounted along the string and provide an elegant sparkling glow that can be seen from any angle. Please note: The strings are waterproof and are fully submersible in water, however the plug is not. The plug can be used outdoors in a covered area, and can also be used in a non-covered area if it is used with a waterproof electrical box. 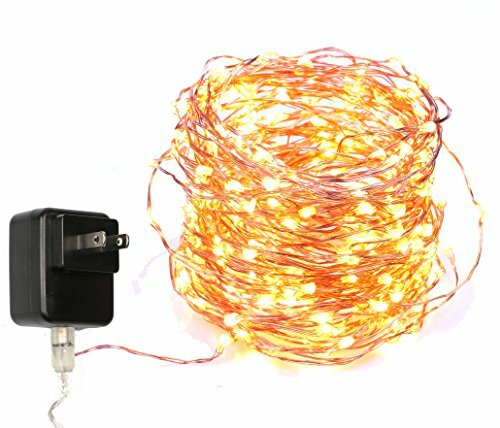 LED String lights composed of Ultra Bright White Warm Color Micro LEDs that don't overheat giving a light fairy effect. After hours of use, they are completely safe to touch without risk of burns. Its safety is guaranteed with UL certification. The copper wire strand is waterproof with IP65, Low voltage, the AC/DC Power Adaptor is 110-240V input and 3.6V 1A output. It is UL llisted for use in USA. The whole string is very low energy consumption. It will only burn very little energy for 24 hours working day after days.